Hamas, the major force behind a four-year suicide bombing campaign and sworn to the destruction of Israel, decided Saturday to run in a Palestinian parliamentary election, a move that threatens to undermine Palestinian leader Mahmoud Abbas' efforts to make peace. A victory by the militant group in the July 17 vote — days before Israel is to begin withdrawing from the Gaza Strip — could dictate whether the Israeli pullout spawns more talks or stalemate. Hamas political leader Mohammed Ghazal said the group would decide after the vote whether to join Abbas' Cabinet and whether to support his moves to renew peace talks with Israel. "Until then, anything can happen," Ghazal told reporters. "We still haven't decided whether to be a part of the Palestinian government and we haven't decided on the issue of Israel ... we will decide in the future whether to talk to them." 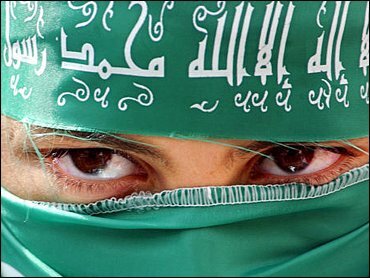 Hamas, founded in 1987, is the largest of the three Palestinian militant Islamic groups. The other two are Islamic Jihad and Al Aqsa Martyrs' Brigades. Hamas is responsible for most of the suicide attacks against Israelis. In Gaza, meanwhile, about 2,500 unemployed Palestinians stormed the parliament building, throwing stones at police and breaking windows. One man waved a piece of bread and a woman held up an empty pot, while police in full riot gear fired in the air to disperse the crowd. The internal unrest underscored the obstacles Abbas has to overcome to lead his Fatah party to victory in the parliamentary election. Hamas did not participate in the last parliamentary election in 1996, refusing to recognize the interim peace deal that led to the establishment of the Palestinian Authority. But the group has emerged as a key player in Palestinian politics, with an overwhelming victory in municipal elections in Gaza in January and gains in a West Bank vote. Hamas has won popular support partly because of its fight against Israel, but also because it has provided welfare and social services to poverty-stricken Palestinians, especially during the last four years of fighting when the situation has worsened. Abbas said he was not surprised by Hamas' decision and encouraged other Palestinian factions to compete in the election. "I think this is a good step that we should react to positively," he told reporters. Abbas, who is under intense Israeli and U.S. pressure to rein in Hamas and other militant groups, is trying to co-opt the groups, fearing a crackdown would lead to internal fighting. Israel and the Palestinians have been observing an informal truce declared by Abbas and Israeli Prime Minister Ariel Sharon on Feb. 8. But sporadic violence has persisted, including a Feb. 25 suicide bombing in Tel Aviv that killed five Israelis. Israel plans to withdraw from the Gaza Strip and four West Bank settlements toward the end of July. A cease-fire would allow Abbas — who is trying to consolidate his power after the November death of Yasser Arafat — to renew peace talks with the Israelis, reform his corruption-ridden government and attract donor money needed to begin rebuilding institutions that could better the lives of Palestinians. But some Palestinians who voted for Abbas in a January presidential election are rapidly losing patience, demanding the Palestinian leader make good on his campaign promises. Abed Abumahadi, one of the organizers of the demonstration at the Palestinian parliament, demanded Abbas create jobs and provide Palestinians with welfare services and a free education. "So far we have nothing," Abumahadi said. The clash in Gaza came just two days after a group of 20 gunmen stormed a hotel in Ramallah during a meeting of Fatah activists. The gunmen demanded the 1,200 Fatah members make good on promises to reform the Palestinian Authority and ferret out corruption. After the Gaza demonstration, a few hundred protesters stayed behind, pitching a tent outside the parliament building and vowing to remain there until the government meets their demands. Gaza has been especially hard-hit by the fighting. Thousands of Palestinians who worked in Israel until violence erupted in September 2000 suddenly found themselves unemployed. The fighting, harsh Israeli army raids and a breakdown of internal authority made life unbearable for many of the 1.3 million Palestinians living in the crowded, poverty-stricken coastal strip. While the Palestinian Authority — its institutions battered by the fighting — failed to provide for the poor, the Hamas political wing filled the vacuum. Palestinians viewed the organization as corruption-free, while accusing government officials of making off with millions of dollars earmarked for public programs. "We decided this because the Palestinian people want us and want an honest leadership," Ghazal said after announcing Hamas' decision to compete in the July vote.